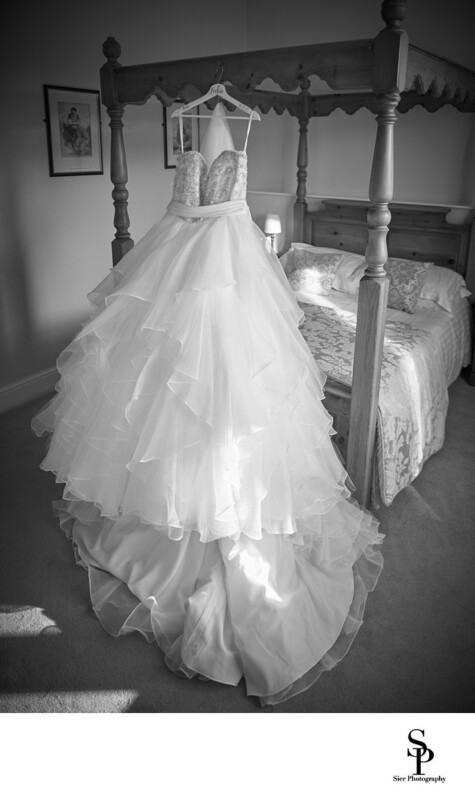 A photograph of a bridal gown hanging in the Bridal Suite of the Cubley Hall Hotel, Penistone near Sheffield. This was our first visit to Cubley Hall and what a lovely venue it is. Cubley Hall is situated high up on a hill and has the most magnificent views from the rear garden which is also the location of the bandstand where it is also possible to get married. The wedding ceremony for this wedding took place in the barn located to the side of Cubley Hall. This large and spacious building has a large main room that also serves as the setting for the wedding breakfast and the evening reception. We have been wedding photographers working out of our home city of Sheffield since 2005. We have been to some wonderful locations and met some fantastic couples not just in Sheffield but all over the region and on a few occasions further away. Our job as photographers on your wedding day is to capture as many of the details as we can. The details are not just the large sections of the day, the wedding ceremony, the speeches or the first dance but many, many other things like your flowers, shoes, jewellery or wedding dress. Most of these items will have been expensive, have been carefully selected and will probably not be used that often, it is important therefore to record as much of the details of them as we can as part of the record of your day. 1/250; f/2.8; ISO 250; 24.0 mm.